The “big impact” of Northumberland’s “diminutive Rochester Roundhouse” has been praised by leading British architects. The Royal Institute of British Architects Journal (RIBAJ) has Highly Commended the Roundhouse at Rochester in its MacEwen Award celebration of “Architecture For The Common Good”. The development at Rochester was carried out by students from Newcastle University’s School of Architecture, Planning and Landscape, working in partnership with the local community and Kielder Water & Forest Park Development Trust’s Art & Architecture programme. 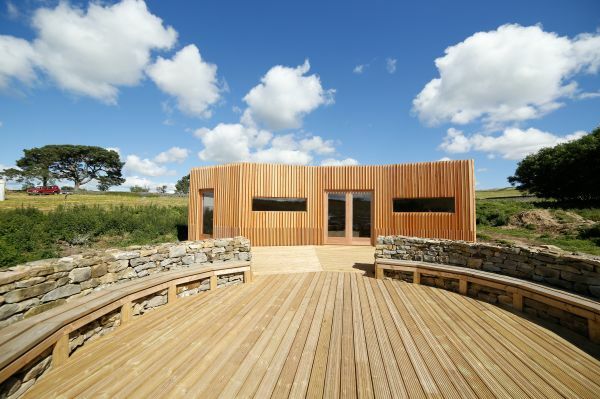 RIBAJ commended the project, referencing its position within the Northumberland National Park, saying: “Any building makes a big impact, no matter how small. And the diminutive Rochester Roundhouse certainly does. Peter Sharpe, Kielder Art & Architecture curator, said: “It is fantastic to get national recognition of the value of the Rochester Roundhouse to the wider community. The development was the result of outstanding collaboration between partners and the community and this recognition from the Royal Institute of British Architects reflects that collective spirit and ambition to create something lasting. Students worked closely with the local community to design and construct an open air amphitheatre and contemporary timber pavilion to be used for stargazing, musical performances, and a range of community workshops.